As you can probably guess, the curve was "deadman's curve" and Frankie bought the farm. We get occasional glimpses in that first episode of how complicated the various relationships are. Karen's sister, Peggy, is bitter over something to do with their mother. A friendly older couple (Lila and Roger), blame Lila's rich but irresponsible father for their son's youthful wildness. 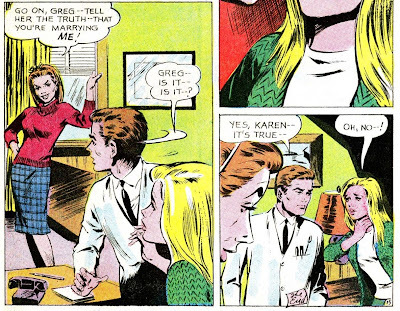 Karen had formerly been engaged to the young local doctor (Greg Marsh), but now he's involved with Rita, who'd previously been engaged to Ray Silva, a ne'er-do-well nightclub operator. She grew up on "the wrong side of the tracks" and so she's always felt inferior. 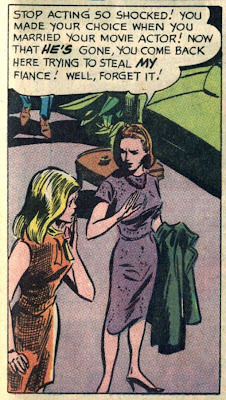 She may not be a "good" girl, but she's not a cardboard cutout villainess, either. 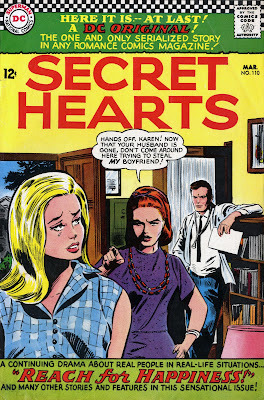 Comments: Excellent opening to this series, with complex characters and terrific art (although Colan apparently left for Marvel by Secret Hearts #114, as he did only the cover and splash for that issue). Yes, the story follows all the soap opera tropes, with tears coming more often than kisses. But that's the nature of the genre, and I heartily recommend the early issues of this series as worth the read. Wow, Colan romance art. God, is he good. Never seen it before--it's absolutely terrific. Many thanks for postng it! 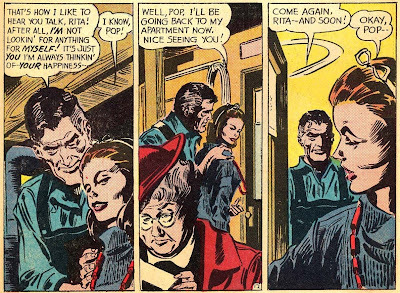 The first issue I have of the "Reach for Happiness" series is one of the later issues, #128 -- so it is great to see interiors from the first one! I am going to link up to this on Sequential Crush! Anonymous, I agree. 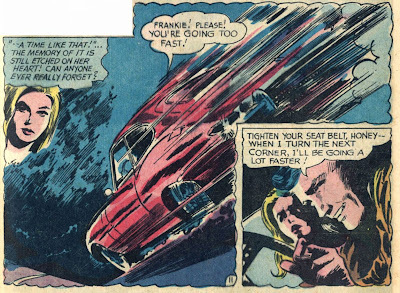 One thing I should have mentioned is his obvious love for cars; in the first few issues we see two Rolls Royces, a Jaguar, and Frankie's car looks like a Porsche to me. Jacque, email me if you'd like to see scans of those five issues. Hey Pat! I gave you an award. Congrats! Giant Superboy Is Watching You! This Looks Like a Job for... Superman!